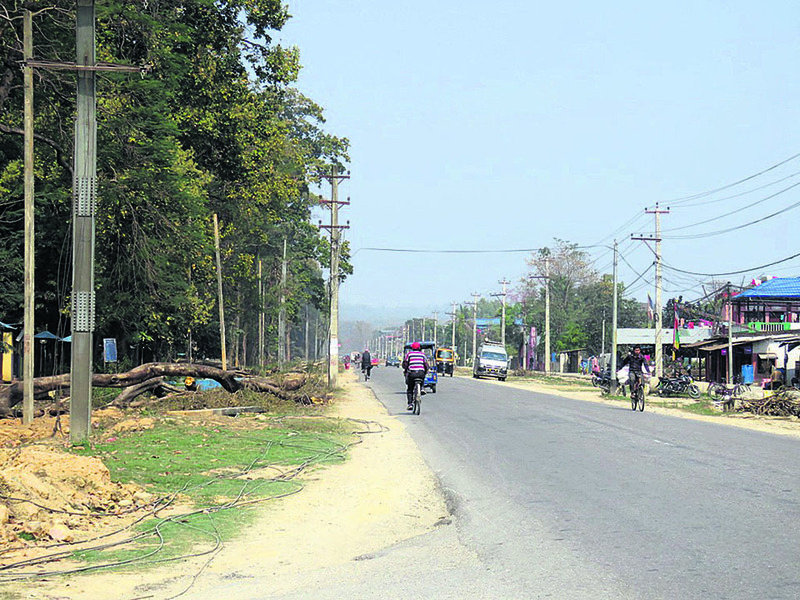 CHITWAN, Feb 22: Even after two years of commencement, the expansion work for 4.49-kilometer-long bypass road connecting Aaptari to the Central Bus Terminal in Bharatpur is yet to complete. The project had started with a 15-month deadline for completion. The road conjoining Narayanghat-Mugling Highway to the East-West Highway is set to be converted into a four-lane expressway to facilitate better transport services and save time. He further added that the road, which was undertaken by the contractor, was first designed as a dual-lane bypass road. However, a design overhaul saw it being changed to a four-lane road which significantly delayed the time for completion, according to him. Lamicchane also said that the contractor activated an extension clause in the agreement, increasing the time of completion by six months. The project was worth Rs 234.582 million when the contractor undertook to construct the dual-lane road, he added. The road will have a breadth of 24 meters that includes canals on each sides of the road. There will be a 1.5-meter-wide median to divide the lanes into two directions. Two-lane roads do not require median. “To save cost, the project was delayed only after the final design for the four-lane road was finished, which took a lot of time,” said Lamicchane. The first phase of the project is expected to be completed within mid-August. Currently, the work to displace 300 electric poles and 88 telephone poles of Nepal Telecom is underway. Rs 800,000 have been allocated to cut down trees for the road project. Nepal Electricity Authority (NEA) has demanded Rs 20.895 million as the cost of removing electric poles. Till now, Rs 4 million have been allocated to the NEA for the purpose. Due to the increased budget for construction of four-lane road, the project has now been divided into two phases. According to Lamichhane, the budgetary requirements for the improved design have already been filed at the concerned ministry after carrying out necessary survey. Only 15.5 meters of the total width of the project will be utilized for roads, whereas the remaining 8.5 meters will be utilized to lay solar panels. The project committee will ask for an additional budget for the project. About 30 percent of the project is already completed. However, the construction of drainage will be a challenging part of the project, according to Lamicchane.